This was a commissioned project. As you may have already guessed, my customers are the owners of Zephyr Brewing, located in Denver, Colorado. These guys are great folks and have ordered a number if items from me in the past. 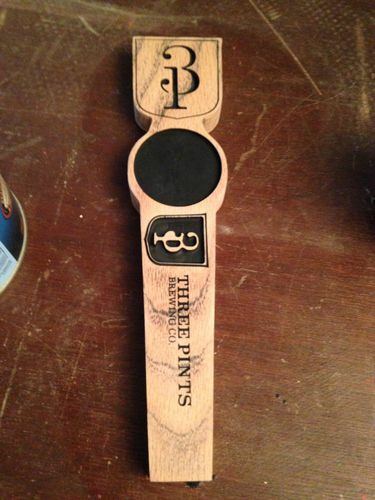 They needed some tap handles for their pub and sent me a picture or two of what they would like to have as well as the budget they had. It didn’t take long until we came up with a plan and I got started on the build. The wood is reclaimed poplar – you may be able to see a couple of nail holes here and there as well as a dent or scrape – just lends more character to the piece! The rough work of shaping and cutting the ridges was finished and then a couple of coats of tinted Danish Oil was applied and allowed to cure. I then used a thin coat of shellac to seal everything in preparation for the lettering. The brass inserts were then tapped and carefully screwed in using a jig on my drill press – the drill press was unplugged and I spun it by hand, in case you were wondering. I created a stencil and figured out a system that would place the lettering at the same place every time – when you need to spray 48 sides, easy and proper placement is paramount! I used spray ink purposely created for stencils – the stuff really worked well and didn’t stink like spray paint does. After spraying the logo, A few coats of spray lacquer finished the handles. Customer is very pleased with the pictures I emailed him – should ship out this week. Nicely done, knot. I have also been commissioned to make some tap handles. How much did you charge for yours? I’m making 50 (at least), and don’t want to be too high…but it’s going to take some time. Here is a pic of the first sample…they like it. Thanks for the compliments! Yours is SO much different than mine that I don’t think they are even comparable. I had to keep mine on the simple side as the budget wasn’t there for CNC Routing/Laser cutting. I kept the shape simple as well so as to be able to cut them all on the table saw – you have a LOT more setup to do. That look fantastic, by the way. I haven’t seen square tap handles before. These look good and unique too. I also like BGW’s version. The brew industry has done you well, and you them. As a Denverite it is great to see that a new local company is taking the time for hand crafted items. Look great and looking forward to seeing them once opened. Did you make any plans or get a follow up commitment where patrons could purchase tab handles? I am just asking because I have built keezers with 4 to 6 taps for my brother and several of his friends. I have seen them start to collect tap handles as their beer selection rotates.